My niece Rachel had her wedding reception in the barn this past weekend. Rachel is my youngest sister Candy and her husband Keith's oldest daughter. She loves to travel and so her, and her beau Dalton, eloped and got married a few weeks ago in the Austrian alps but were excited to celebrate with friends and family when they got home. When our middle daughter Hopie was little, she had a wedding dress that we bought at a yard sale somewhere that she wore everywhere. I can still remember seeing her riding her bike all around the apartment complex we lived in day-after-day, wearing the wedding dress. It was quite a site. So I thought it would be special to find a little wedding dress for Indy to wear to surprise Rachel. Indy was so excited. I'm not sure she knew exactly what a wedding reception was, but she knew that she felt "bootiful Papa" and that's all that mattered. Candy and Rachel and some other neighbors and friends spent all day Friday decorating the barn and when Indy and I crossed the driveway and walked in that evening, we could hardly believe how beautiful it was. Indy loved Rachel's pretty dress too. She spent most of the evening twirling and dancing and shaking people's hands and hugging people she didn't know and a few she did. After a wonderful dinner and dessert, my brother-in-law Keith gave a beautiful toast and so did Dalton's stepfather. I even got a chance to stand up and say a few words. It was a such a special evening in a special place. 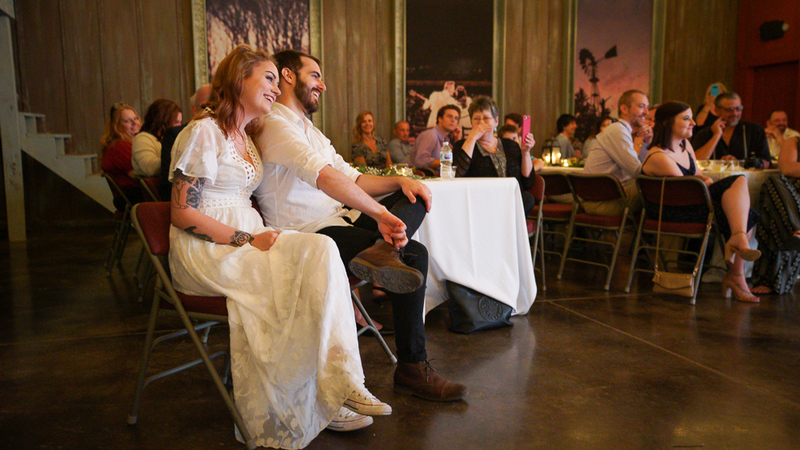 The weekend before, we had held concerts in the barn and I was singing songs and telling stories about me and Joey's marriage and here we were, celebrating a brand new marriage in the same room. Before long it way past Indy's bedtime and the party was winding down. And although Dalton got the first dance with the bride... I got the last dance with her. Well, with my little-bitty bride that is. It was to an old Keith Whitley song that her Mama and I used to dance to.